Thinking about recent arguments on climate, I have been trying to work out the logic of the air/sea interaction in order to make sense of the pattern of warming. My current conclusion is that, on a very simple model, what we observe is qualitatively about what we would expect if at some point around the year 2000 net energy input to the system had for some reason declined. The purpose of this post is to sketch the argument and see if people commenting see anything wrong with it. My model is a very simple one. The whole atmospheric system is one object with uniform temperature, the sea another object with uniform temperature. The atmosphere gains heat via net radiation input from the sun, loses it via conduction to the sea. At any instant the temperature of the atmosphere is atmospheric heat/atmospheric heat capacity, and similarly for the sea. If atmospheric temperature were constant for a sufficiently long time the two temperatures would approach equality, but atmospheric temperature has been rising due to net energy input from the sun. Heat loss to the sea by conduction is proportional to the temperature difference between atmosphere and sea. If the net input from the sun had been constant for a sufficiently long time, the equilibrium of the system would be a constant temperature difference between atmosphere and sea. That gives a constant net heat increase for the atmosphere (radiation in, conduction out) and for the sea (conduction in). Atmosphere and sea are warming at the same rate because if atmosphere warmed faster the temperature difference would be increasing which would increase heat flow from atmosphere to sea which would decrease the rate of warming of the atmosphere, increase that of the sea, until the two equalized. I am ignoring the fact that as the whole system warmed it would radiate more out to space. For simplicity I assume that that effect is small over the range of temperatures I will be looking at, so we can assume constant net radiative input. I am ignoring the fact that if the process went on long enough the sea would boil. I'm looking at much shorter time period than that—decades not millenia. Now assume that something changes, reducing net radiative input just enough so that heat coming into the atmosphere via radiation is just equal to heat leaving the atmosphere via conduction. The atmosphere stops warming. But it's still warmer than the sea—that's why it is losing heat via conduction. And since it is still losing heat by conduction, the sea continues to warm. Gradually that warming reduces the temperature difference, reducing the rate of heat transfer from atmosphere to sea, slowing the rate at which the sea is warming. If net radiative input remains constant, atmospheric temperatures will gradually start to go up again. If, on the other hand, net radiative input from the sun declines at the same rate at which heat transfer by conduction is declining, atmospheric temperature will remain constant, sea temperature will continue to rise but at a declining rate. eyeballing it, temperatures appear to flatten out sometime between 1998 and 2002 and remain roughly constant thereafter. Figure 2 is the same graph of ocean heat that I discussed in a previous post. 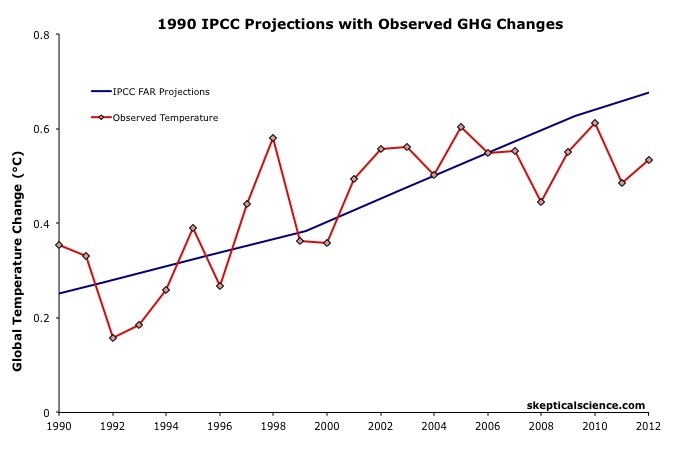 Eyeballing it, the rate of warming appears to decline about 2003. This is a very simple model and a very simple description of the graphs. Since both graphs have a lot of noise, a simple description may be the best we can do. As should be obvious, my point is only qualitative. I have not made any calculation of how large the heat flow should be from atmosphere to sea as a function of temperature difference and I have not offered data on the actual size of the temperature difference over time. All of that would require a much more elaborate analysis. My point is only that the observed pattern of atmospheric temperature going flat followed by ocean warming slowing but not stopping is the pattern one would expect if net radiative input dropped. It is thus consistent with the idea of a pause in warming, not in the sense of temperature increase of the whole system going to zero—the sea is still warming—but of the temperature increase of the system slowing in the way to be expected if atmospheric warming stopped. 1. Have I made any mistake in my analysis of the simple model? The only problem I see is that the drop in rate of warming on Figure 2 looks too abrupt—on my model it ought to be a gradual change. But it's a noisy graph. 2. Are there obvious ways in which making the model more realistic would change the conclusion? In particular, are there obvious improvements which would justify the claim, discussed in my earlier post, that there is no pause because the "missing heat" is going into the ocean? I take that as meaning that what has changed is not the net radiative input from the sun but the conductive loss to the sea, that the flattening of atmospheric temperature is due to an increase in the latter not a decrease in the former. P.S. A couple of people commenting on this (one on G+) argue that I have the heat flow backwards, that the input from the sun mostly goes to the land and sea and is then transferred up to the atmosphere rather than going in the other direction as in my model. I have not yet figured out the implications for making sense of the data, assuming they are correct. Id say this is qualitatively very robust reasoning. And that indeed, more complex models are pure hubris, given the noise in the data, and lack of repeatability. The only thing that could shed further light on the matter is an order of magnitude estimate of the expected effect sizes; that is, to what degree are the observed changes in temperature explainable by this dynamic? It may be that the expected heat flux different given temperature differential isn't actually significant to the dynamic; or that it 'overexplains' the dynamic, meaning other forces acting the other way are probably in effect. But yeah, a first look at the data is certainly consistent with the hypothesis that the earth as a whole is merely equilibrating, rather than reaching a higher setpoint. Of course this will not make much of an impression on those who (selectively) apply the precautionary principle. They will want you to show the converse. This is consistent with observation and my favorite theory that the sun is weakening and we're in for a good amount of cooling over the next century. I've known about this theory for quite some time, and the data are beginning to corroborate it. The theory predicts that due to a bicentennial drop in solar activity concurrently with a near disappearance of the 11-year cycle of sunspot activity, we are in net energy debt right now. The ocean will, in the near future, give up it's stored heat to the atmosphere, which will keep atmospheric temperatures constant for now. Eventually, the ocean will run out of excess heat and the planet could cool by a degree or more. As the ocean cools, it will absorb more water vapor and CO2, creating a negative feedback by reducing these greenhouse gasses as well as increasing the atmosphere's total solar reflectance (albedo). All of this could lead to the next "Little Ice Age" towards the middle and end of this century. "Heat loss to the sea by conduction is proportional to the temperature difference between atmosphere and sea"
The sea also gains heat by direct sunlight and loses heat (to the atmosphere) by evaporation. "If atmospheric temperature were constant for a sufficiently long time the two temperatures would approach equality"
No, because evaporative processes would always maintain a difference in temperature. Evaporation cannot be ignored: it has two effects, it moves heat from the ocean surface high into the atmosphere where it is radiated to space, and it causes the formation of clouds which reflect solar radiation to space. If the sun sends less energy, the atmosphere will cool and the sea will cool resulting in less evaporation and thereby less cloud cover and less radiation from atmosphere to space, reducing the impact of the fall in solar energy. How come all of your previous posts from this month have disappeared? Tibor asks about my previous posts. I wondered about that last night, when I noticed it. They are still there--the bar at the right of the page has links to them. But something has changed in the interface so that it is only showing one post at a time. I'll see if I can figure out how to change it back. It's been my understanding that the atmosphere is largely heated by infrared radiation from the earth, and maybe the seas. I was informed that the ultraviolet and visible sun rays are absorbed by the land and oceans, which then re-radiate energy in the form of heat, and specifically in the very band of absorbtion by H2O bonds in water vapor in the atmosphere. A counter-factual way of looking at the ocean energy graph is that there are two superimposed processes. The first is a roughly sinusoidal process with a full cycle period of about 2 decades, and the other is an upward trend with an increasing slope over time. The 1950's rising, 60's falling, 70's rising faster, 80's barely falling, 90's rising even faster, and the 00's are only slowly rising. This would imply the periodic process would have a rise in the (roughly) odd decades, and a fall in even decades. In this counter-factual the most recent 'down' cycle has been overwhelmed by the generally increasing process so that even in the 'down' period there is an increase. That is not to say which is correct, but this also describes the data presented. Robbo has the key point about evaporation. The model should be radiation heats the ocean (and land), the ocean warms radiates and evaporates to the air. Evaporation cools the ocean, and slows the radiation going to space through the atmosphere, but moisture in the atmosphere is less stable - more rain events and storms over the ocean, which dump rain and energy to the ocean, and potentially more radiation to space during these events. If the model is simple enough that it does not produce cyclic behaviour, it is probably too simplified. Have you seen this piece from National Review? Honestly, I think it's a shame it hasn't gone viral. What it highlights is the fact that the proposed policies put forth by the present administration would have almost no effect on the climate, and the costs of trying to mandate actions towards it are likely much higher than the rewards. I thought it had some parallels with your draft chapter from TMoF, "The Misuse of Externality Arguments." You noted that the debate over climate policy has some similarities with the debate on overpopulation that took place four decades ago, and Cass draws a comparison with the Nuclear Disarmament movement's arguments from that same time frame. The problem Tibor noticed--the page only showing the current post--has now been fixed. It turned out to be a known bug resulting from putting images on the page by pasting them instead of uploading them. And you can see that there's notable variability that correlates with el nino. It seems like a pretty key factor. I have no idea if there are feedback effects -- climate variations making el nino or la nina more likely -- but you might want to consider taking those into account. There's a direct effect of the atmosphere being heated by the sun, and an indirect effect via rays hitting the sea and being re-emitted as less energetic infrared at night. For the post's model, maybe the ocean surface and the atmosphere should be combined, and "ocean" should mean below the thin top layer, down to where it's not radiation from the sun but conduction and convection. Either way, doesn't evaporation have to be considered? If I've got it right, evaporation absorbs energy, cooling off the system. That, not reduced sunlight, could be your source of reduced energy. I write this as an economist who doesn't really understadn this stuff, so I don't want to sound too persuasive! The degree of willful ignorance (and basically anti-science and anti-intellectualism) is just astonishing, really you should get some courses and you definitely should start with basic math and basic physics. Most relevant of all – the energy that Earth gets from the Sun is basically never directly going to the atmosphere (which is really transparent to visible radiation), it gets either to the top 1cm of land or to the top 100m of water; from there basically all the energy that heats the atmosphere comes as IR. This renders useless all the rest of your pseudo-intellectual mathurbation. And NO, what we see is NOT the system approaching equilibrium, what we see is a system that goes even more out of equilibrium, at which point "heat conveyers to deep ocean" in the Pacific are activated at higher speeds; but this can only last up to the point where we have an El Nino and all that clueless denialist talk has to restart from the opposite direction. The El Nino is very likely coming in about 6 months. "Who Turned On The Heat" has the most detail on the El Nino/La Nina issue--he uses the shorthand acronym ENSO, for El Nino Southern Oscillation, which he admits is a misnomer but is easier to type :). (1) Looking at the data over at least the past few decades, virtually *all* of the warming observed occurs during major El Nino events (the 1998 El Nino being the latest of these). In between major El Ninos, global temperature is basically flat (as it has been since the 1998 El Nino). (2) We do not understand what triggers a shift in ENSO from one mode to another (the three modes are basically El Nino, La Nina, and "neutral"--Tisdale stresses that these are not points on a single spectrum, as it were--La Nina is not the "opposite" of El Nino, and the effects of the different modes are not always opposed). We can't even predict the onset of a shift reliably on a time scale of months (let alone years); by the time we can "predict" that a shift is coming, it has already started. You might find some of "The Blackboard's" posts on this subject to be helpful; search the site for "ocean heat". Here's a recent example, from September 2013: Alternate units: Average Temperature Change Over Layer. Deficit Data Confusion at Whitehouse.gov?